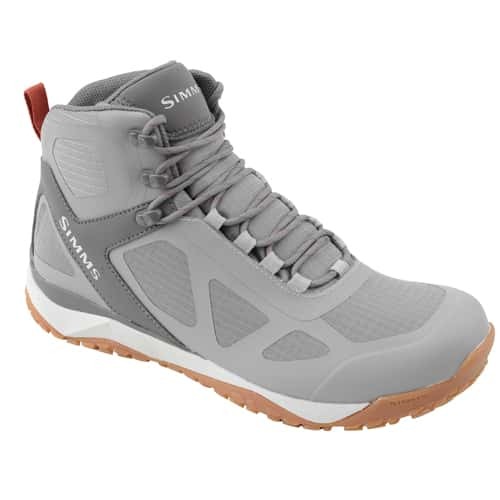 The Simms Challenger Mid Boat Deck Fly-Fishing Shoe is a very innovative Simms boat deck fly-fishing shoe that is perfect to wear while you are fishing on boats. This Simms Challenger Mid Boat Shoe is constructed with a Right-Angle Footbed and TPU heel clip for ankle support and lateral control that contains really excellent comfort and support on the boat deck. The Simms Challenger Mid Boat Deck Fly-Fishing Shoe is made with siped non-marking rubber outsole for maximum slip resistance that is a wonderful feature of this very innovative and feature-rich Simms Challenger Mid Boat Deck Fly-Fishing Shoe. The waterproof Simms Challenger Mid Boat Deck Fly-Fishing Shoe is also designed with a breathable upper membrane, high abrasion welded TPU and rip-stop nylon for a seamless no-line catch upper, Agies anti-microbial treatment, as well as a dual density EVA midsole, so make sure to check out this new Simms Challenger Mid Boat Deck shoe today from the Platte River Fly Shop. Right-Angle Footbed and TPU heel clip provide comfort and support on the boat deck.